After spending a morning at the most touristy photo spot I’ve ever seen in my life, during sunrise at Angkor Wat, I decided that it was probably best I asked my tuk-tuk driver to start taking us to places that fewer tourists visit. We asked to get farther away from the crowds and try to take us to places within Angkor Wat Archaeological Park that were, perhaps, less impressive, but more detailed and less restored. It was the best decision I’ve ever made. Our Tuk-Tuk drive around Angkor Wat was amazing. He did his best to make sure we got to some really cool temples and sights in the area when as few tourists were around as possible. 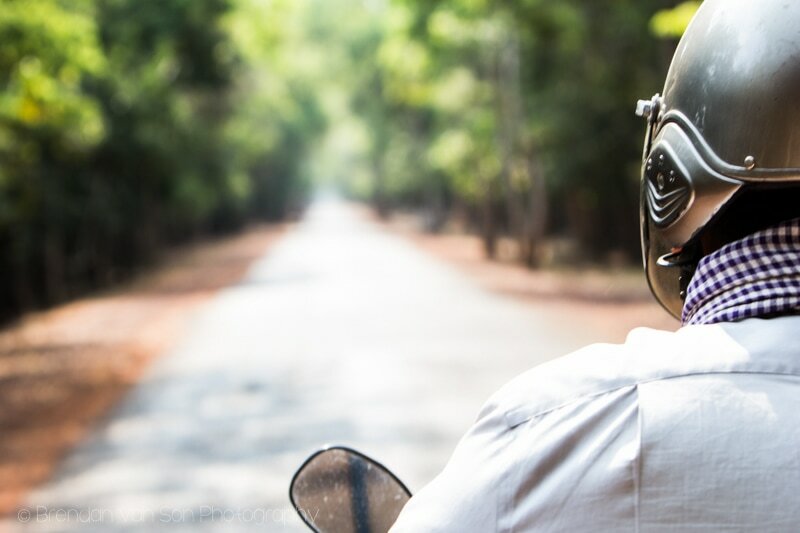 And to be honest, maybe the best part about it all was cruising around in the Tuk-Tuk letting the air cool off what was easily a 35 degree afternoon in western Cambodia. Honestly, after that sunrise in the park, I was worried that I would going to be greatly disappointed with the place, in general. However, within a couple hours of leaving, I realized that Angkor Wat is very much worthy of the crowds that pile through here each and every day. Anyways, this is a photo post from the area. I tried my best to focus my photography in the archaeological park on the details rather than attempting to capture the whole scene. As a photographer, the thing I work the most on is my composition and “eye”. I’m as technical as it comes, so for this visit I really tossed away much of the tech side of photography and really maintained my focus on creating more simple, well thought out, images. Here they are. The first place we went after leaving sunrise behind what this bridge with buddha statues. And well I’m sure every tourist comes here, and they should, it was incredible. 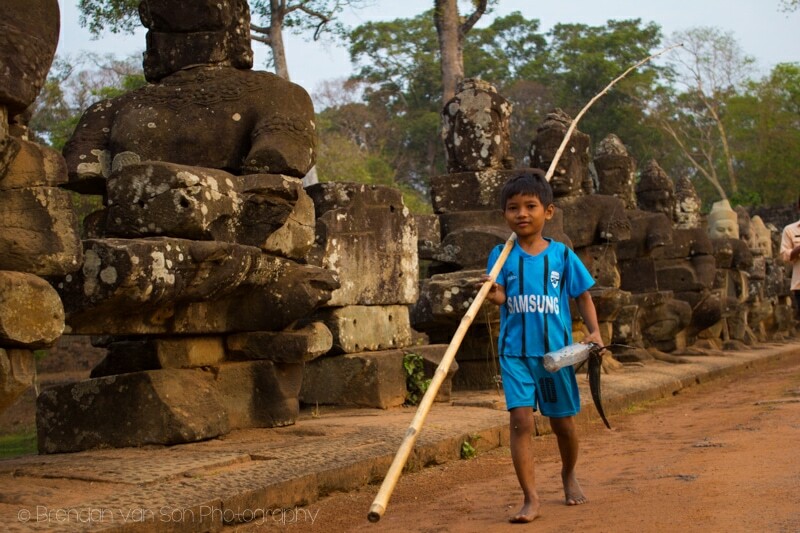 My favourite photo, though, has nothing to do with the statues, but this incredibly photogenic boy heading home from a morning fishing. The monks were interesting to me as well. 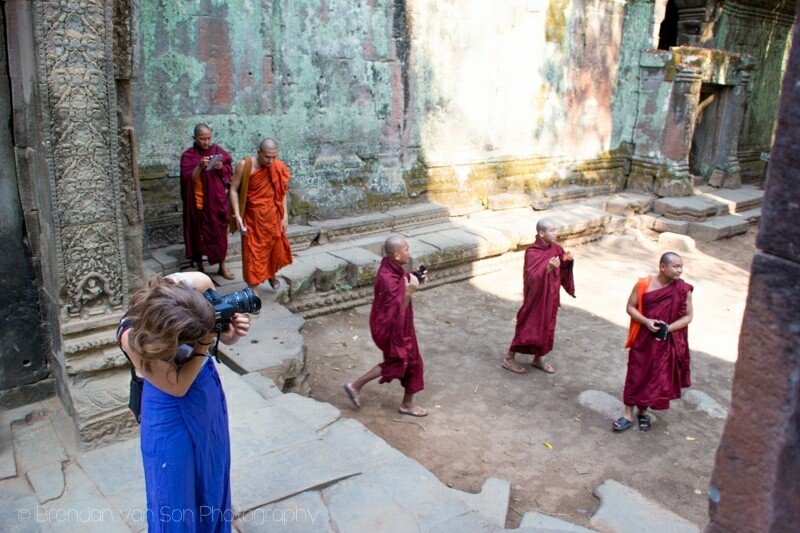 But I would have had a hard time being a monk in Angkor Wat. Everywhere they go, people are snapping photos. Except in this case where Tiffany so concentrating on other things, seemingly oblivious to the group of robe-clad monks behind her. 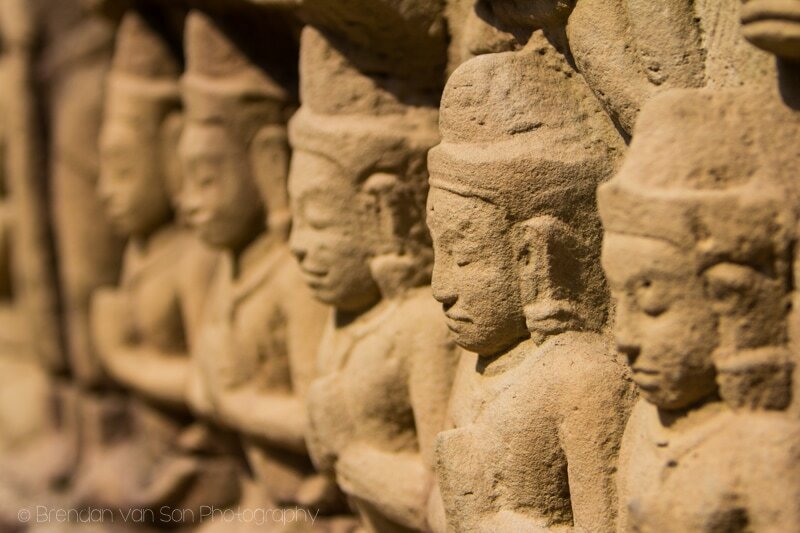 I did my best to focus on the details of Angkor Wat. It’s so distracting to grab entire scenes and temples. Instead, images like this are much cleaner. For me, they also tell much more of a story. 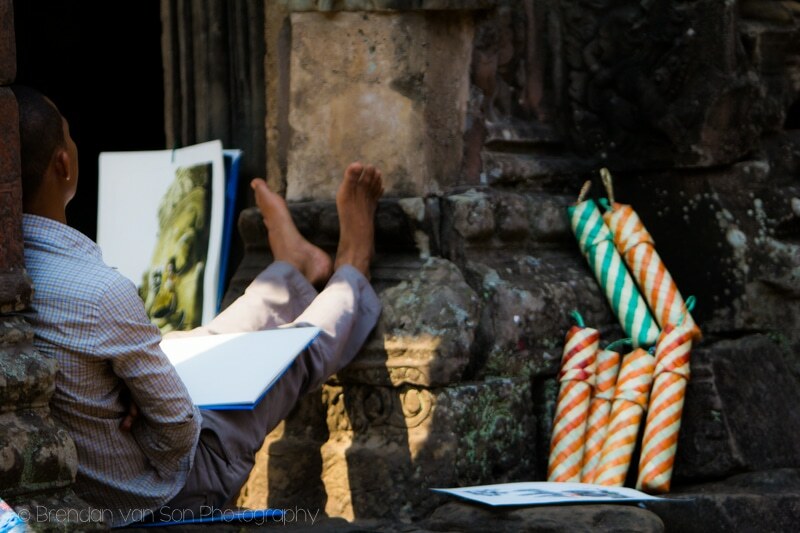 Outside one of the temples, I caught an artist having a bit of a nap with his work along side him. 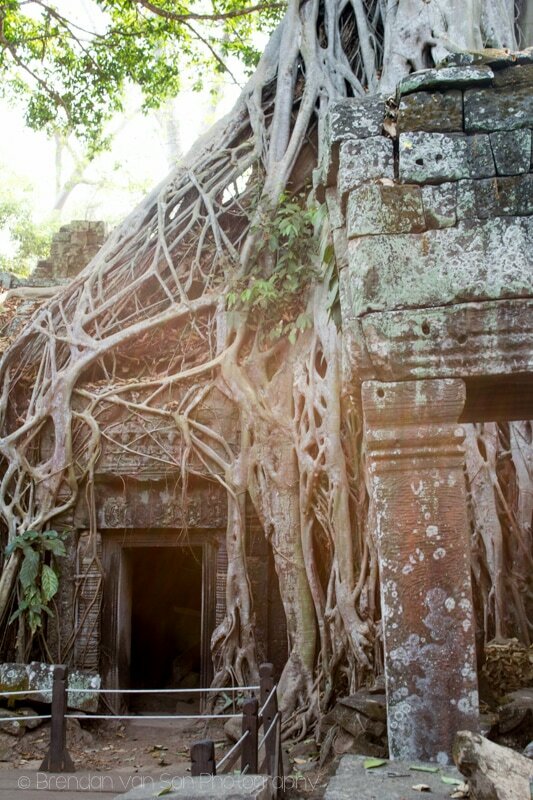 One of the most popular temples, the “tomb raider” temple is almost always packed with visitors. However, they all seem to flock to one section. Around a corner, we found some cool spots that we had all to ourselves. Another shot of the “Timb Raider Temple”. How cool is that? 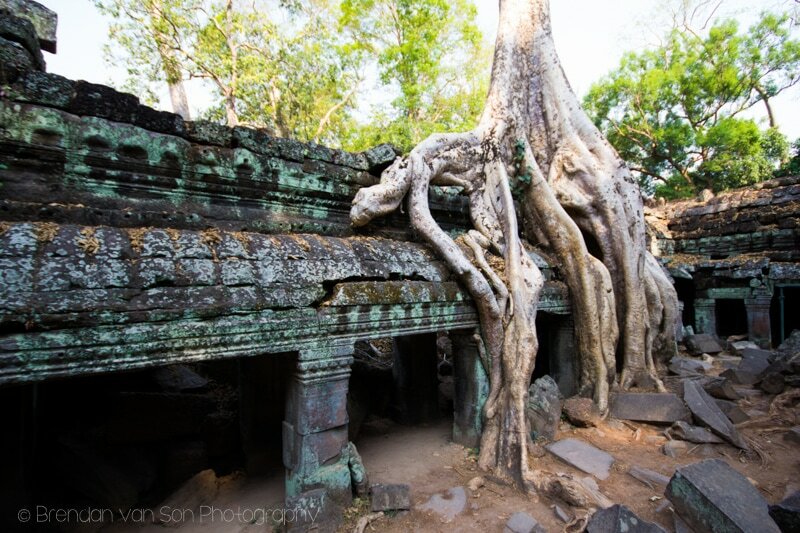 In hindsight, this was actually my favourite temple in Angkor Wat. 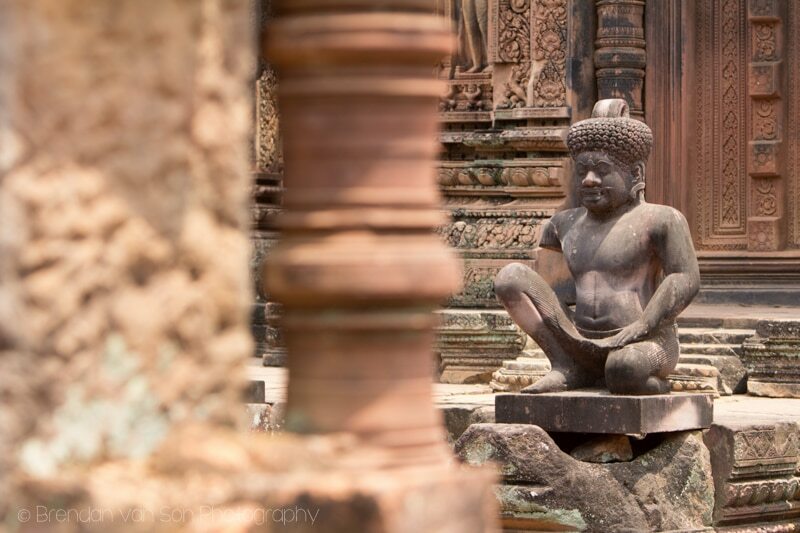 I loved the Buddhas carved into the pillars. 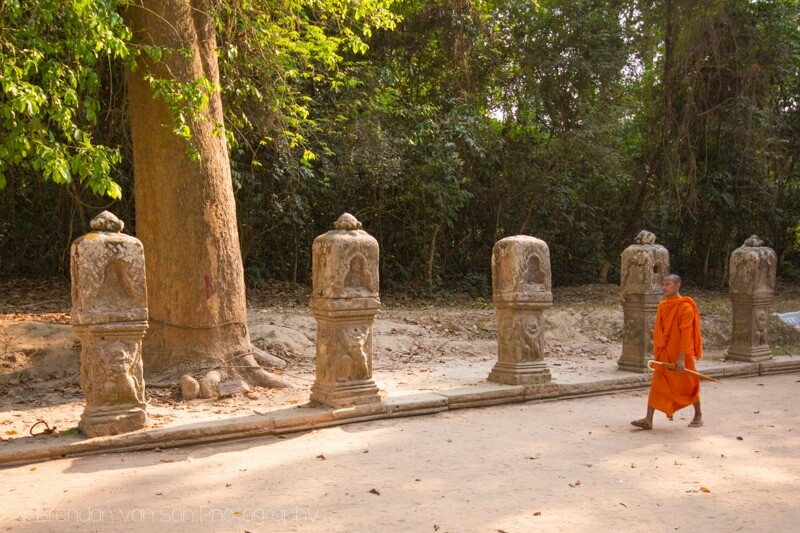 Another monk wandering through the grounds. Again, trying to capture the details. I shot this with a really wide aperture. f/4, so the focus was on the eyes. Our tuk tuk driver was awesome. Love this shot of him driving us through one of the quiet roads of the park. An offering in the middle of one of the lesser visited temples. Loved the contrast of colours here. It’s all so subtle. 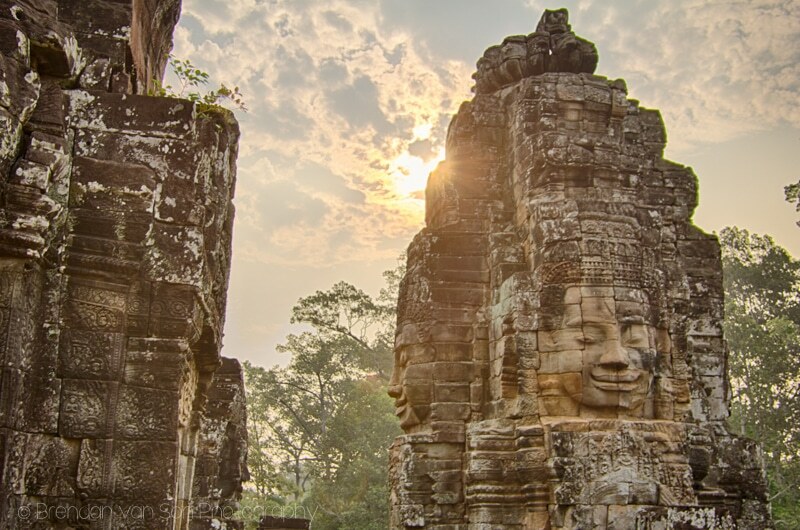 It might be that giant temple photo at sunrise that draws people to Angkor Wat, but it’s the details that are truly special. 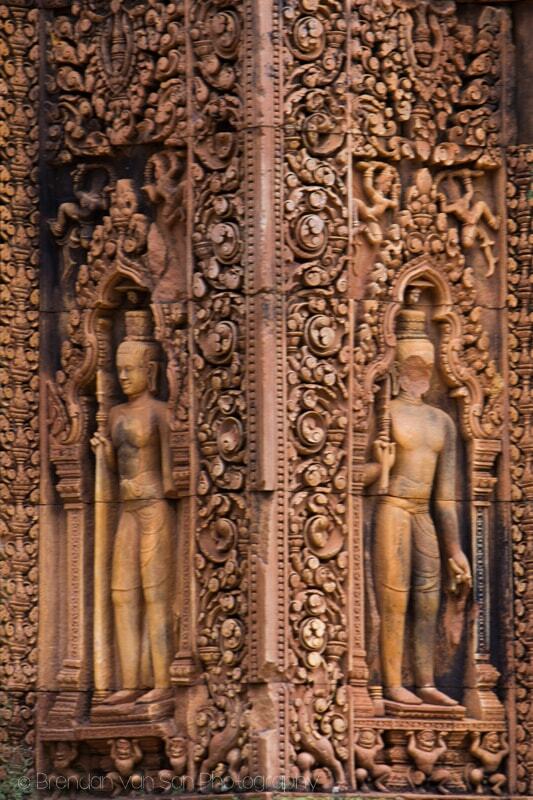 Again, check out the details on this carving! The “monkey” temple was also really cool. I busted out my 70-200mm lens here because I thought that there were actual monkeys. As you’ll see from the next images, I was wrong. The monkeys are statues, of course. I was partly expecting to have monkeys jumping all over me in this temple. 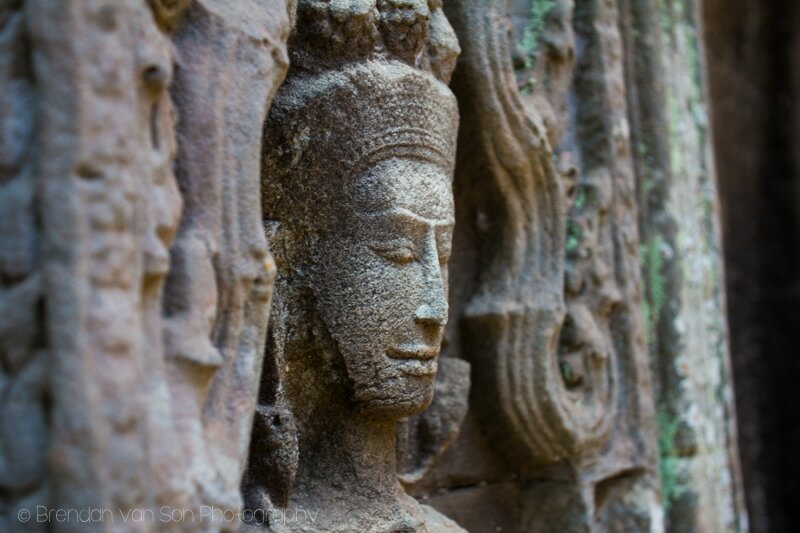 Even in this temple, the subtle details of Angkor Wat Archaeological Park are so awesome. And to end things, here’s a cute little girl that was organizing postcards for her mother that was sweeping footpaths in the park. Of course, you shouldn’t buy from kids this age in the park as their parents have put them to work far too young. However, they love posing for photos, and seeing themselves on the camera. Let kids be kids, have some fun with them rather than just shunning them off and telling them to bugger off. 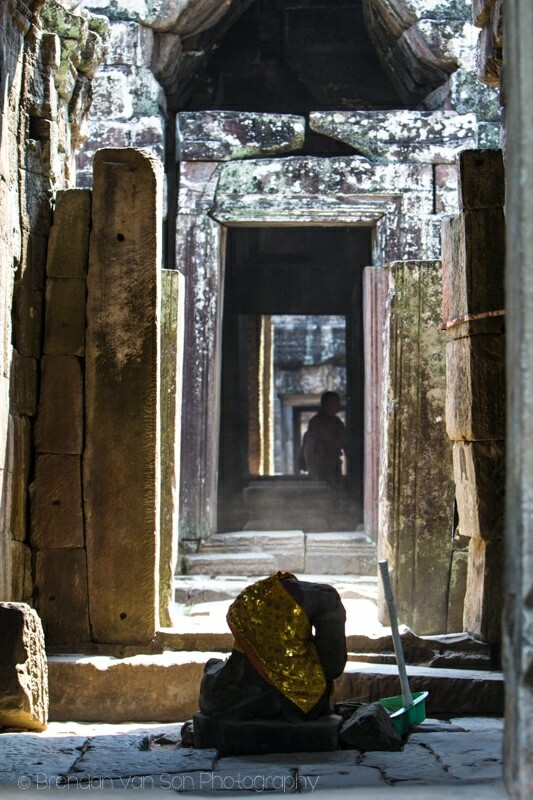 I lived nine months in the “shadow of Angkor” and as you have found, every day, every moment is another photographic opportunity. Great images! 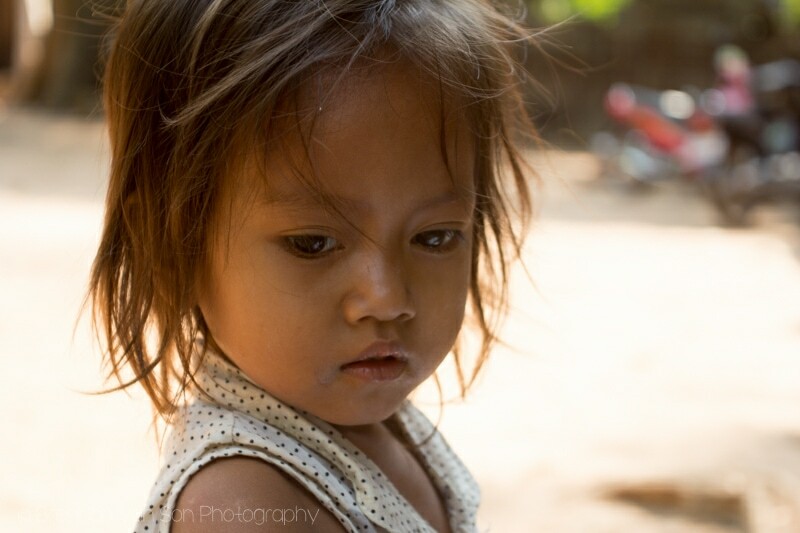 Are you going to be in Thailand anytime soon? Great photos Brendan! 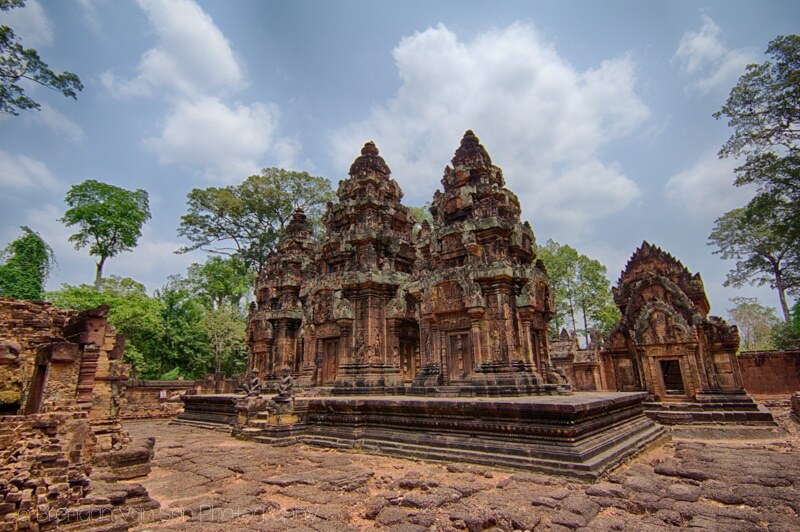 While I loved the main temple of Angkor, it was the smaller less crowded one’s that made our trip so great. 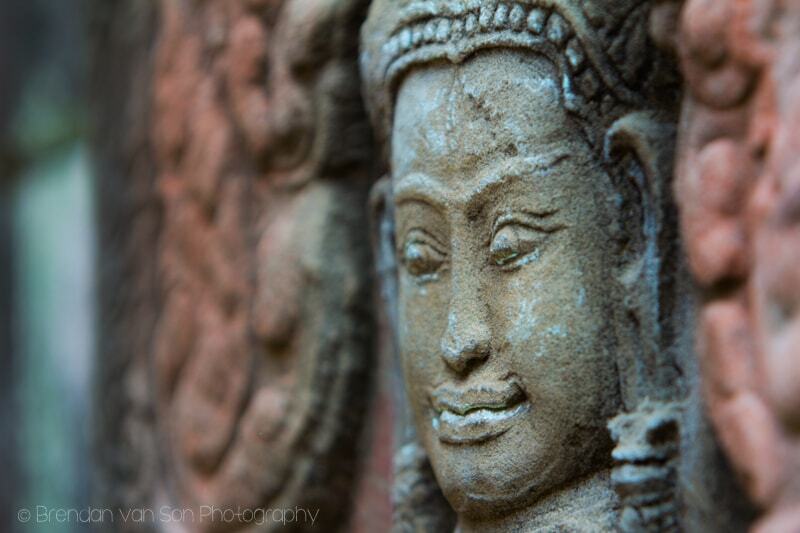 My favourite was Banteay Srei, the pink temple. Yup, that temple is cool! 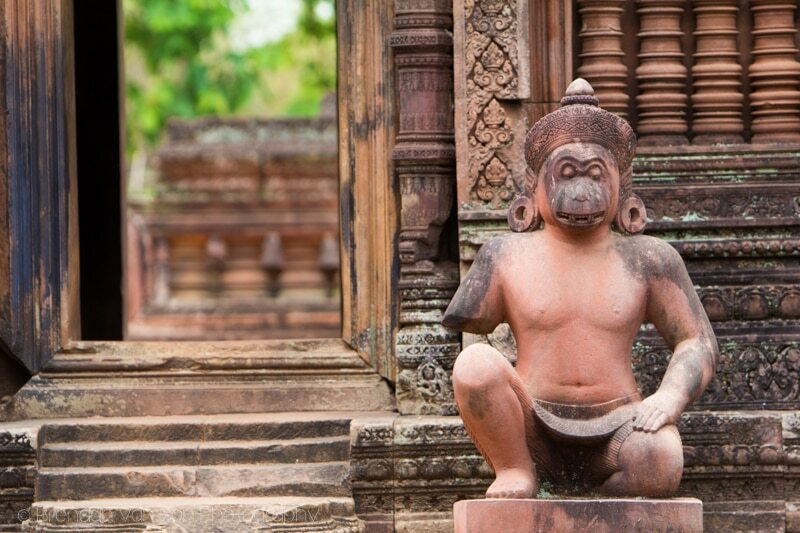 I like the one with the buddha carvings in the pillars the best, followed by the monkey temple!